POHANG, South Korea - Military Sealift Command's maritime prepositioning force ship USNS GYSGT Fred W. Stockham (T-AK 3017) and expeditionary transfer dock USNS Montford Point (T-ESD 1) performed a "skin-to-skin" (S2S) maneuver as part of exercise Ssang Yong 16, March 13. The operation enabled the two ships to test capabilities as well as practice transferring large cargo, such as vehicles, at sea. 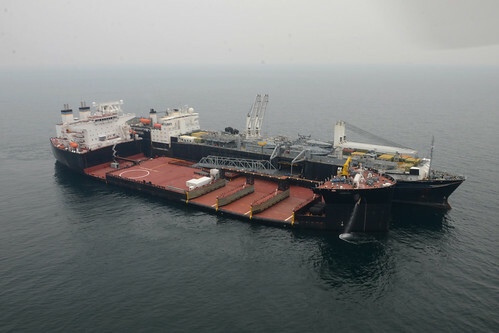 The S2S maneuver is conducted by the two ships connecting side-by-side while the Montford Point acts as a floating pier for a simulated offload. The Stockham can discharge equipment onto the Montford Point through a connecting ramp. 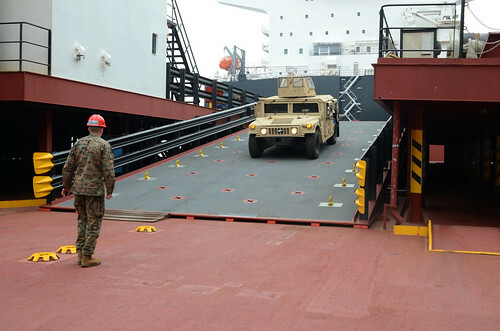 The equipment can then be loaded into landing craft air cushion (LCAC) for transfer to shore, further enhancing Marine Corps and naval integration. The maneuver gained attention throughout the military and Navy Rear Adm. John B. Nowell, commander Expeditionary Strike Group Seven, Amphibious Force 7th Fleet, Task Force 76; Navy Capt. Robert A. Rochford, commodore, Maritime Prepositioning Ships Three (MPSRON-3); and Republic of Korea military officials all visited the two ships while connected S2S. "This kind of operation enables us to bring people, equipment, ammunition, to sea and assemble it as necessary to bring it to shore as a full combat power," said Rochford about the S2S. "We get closer to that ultimate goal when we have other ships involved and when we successfully execute operations like these." The Montford Point is categorized as an expeditionary floating pier-at-sea. The ship is tasked to the Marine Corps to provide a pier-at-sea to move and transfer from large, medium-speed, roll-on/roll-off ships onto LCACs to provide seabasing capabilities for the Navy and the Marine Corps. The Montford Point and Stockham are both part of MPSRON-3. A strong advantage for the pier-at-sea concept includes being able to move at will so as to not become a possible target to unfriendly forces. The makeshift pier can operate 25 miles off shore and still provide support for our military, Rochford explained. In addition to the S2S, the MPSRON-3 ships also hosted the transfer of a vehicle from one ship to the other and flight operations during the maneuver, which were both the first time these activities were conducted while connected during an exercise. "These type of exercises are an opportunity for us to look at the way we currently look at amphibious assault operations, then utilize these platforms to see what they can do," said Rochford. "This clearly has demonstrated the value of these ships and what they can do for the seabasing concept of the future." Ssang Yong 2016 is the largest multilateral amphibious exercise to date. It is a biennial exercise conducted by integrated Marine Expeditionary Brigade/Navy Expeditionary Strike Group, forward-deployed forces with the Republic of Korea (ROK) Navy and Marine Corps designed to strengthen interoperability and working relationships across a wide range of military operations ranging from disaster relief to complex expeditionary operations. MPSRON 3, operating in the western Pacific, maintains tactical control of the 12 ships carrying afloat prepositioned U.S. military cargo for the U.S. Marine Corps, the U.S. Army, and the U.S. Air Force. The squadron's mission is to enable force from the sea by providing swift and effective transportation of vital equipment and supplies for designated operations.